I'm so glad you found it! "First get our website up!" "No, you don't need a website!" Or maybe you've been doing all those things you're "supposed to be doing" to start enrolling clients and building your business, but you're simply not seeing traction. Maybe your eyes are rolling even as you read THIS because here you are...reading another "website." And honey, we both know it doesn't help that there are SO many shiny objects out there that do such a fantastic job of peaking your interest and pulling you in one direction or another. (And maybe going a little cross-eyed from staring at your computer screen)! "I'm officially a certified coach!" << "How fricking cool is THAT?!" I thought. Finally something I was super passionate about. ...ahem - writing, social work, improv, dance, art...ALL! THE! THINGS! It always felt like a resounding "YES!" And, when I first graduated from coaching school, although I was super eager to start attracting clients, I also realized that simply "understanding how to coach" wasn't enough--especially if I wanted to take my business full-time. Finding clients? Getting my business off the ground? Emailing? Marketing? Earning an income? And enough of an income to replace my job? Going fast...but not really moving anywhere at all...at the same time. I knew that if I was going to take my coaching business (and ultimately myself) seriously, I needed to get some help. And, my experience in searching for help led me to create the Business Breakthrough Jumpstart with women like you in mind. I knew I needed answers. in all the free material out there....I invested. So...coaches, mentors, trainings, programs, courses...you know the drill. It's something that no one really stops to say in the marketing. You have a divine brilliance ... right now! All of the noise out there? The shiny objects? The people? The "do it this way"?? It pulls you out of YOU, and into someone else's story. The unique way you help others. I was tired of being pulled in different directions and simply not knowing which was right. Which meant they ultimately didn't work. I've been in the game for a while, and I was tired of seeing brilliant women and men stopping themselves or not succeeding because they end up in the wrong program with the wrong mentor. They ended up following advice that simply does not produce results because it's not customized or authentic to they way they - the individual - works. We can achieve MASSIVE results that we simply can't on our own. Which is why I put together a program I'm UBER passionate about. is about you getting out there to spread your message and getting clients NOW! 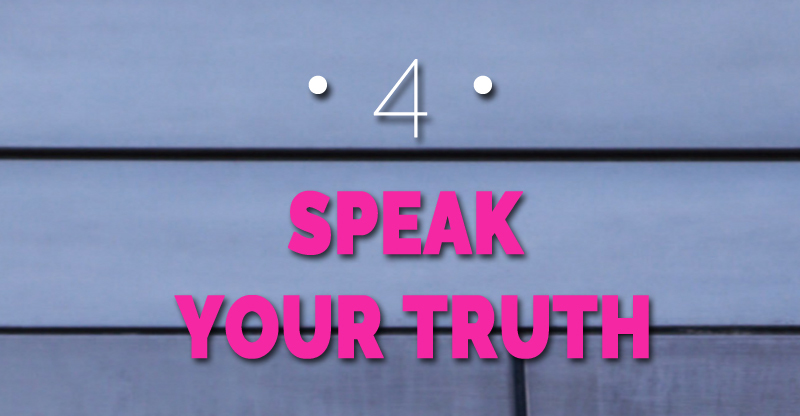 ✔ It's about doing things YOUR way, with a high-level coach leading you step-by-step through exactly how to successfully grow your business while being in integrity and authenticity to yourself. ✔ It's about streamlining systems and sharing all the tools I've used that actually work... to make your life easier. ✔ It's about saying no to things that don't resonate with you so you can say yes to the things that do: when you can differentiate this, your business will explode. ✔ It's about creating win-win relationships and creating income from a place of love, curiosity, and excitement. ✔ It's about attracting the right clients the right way, and starting your business without the complexity, overwhelm, or worry. Strategy + Mindset + Community = Success. I created it with YOU in mind, boo! In your corner and cheering you on! ✔ You are a new or emerging entrepreneur who is making under $3000 monthly in your business. ✔ You are ready to attract ideal clients with authenticity and ease. ✔ You want a clear-cut path and solid understanding of the right steps to take as new business owner, knowing exactly where to start, what your day-to-day tasks are, and how to prioritize biz-building activities for rapid success. ✔ You’re ready to increase your confidence, own your personal power, and step more deeply into your role as a leader in your work. ✔ You want to lay the groundwork to see quick successes in your business while setting up solid/ long term strategy you can rinse and repeat. ✔ You’re eager for the personal and professional fulfillment that comes with setting yourself up for continued success and seeing yourself and your clients thrive. ✔ You want to reach your income goals while empowering and helping make an immeasurable impact in your clients’ lives. ✔ You may or may not have invested in a coach or business program before, but aren’t reaching your income goals, or haven’t seen the results you’re looking for. ✔ You’re ready to understand how to leverage energetics, spirituality and new ways understanding your thinking will rapidly bolster your business success. And! You’re ready to serve others and get paid to do what you do best! TheSE Modules are purposeful and powerful. They were created so you can work smarter, NOT harder. So that you can attract clients while laying the foundation for a successful business. You’re going to understand exactly what actions you need to be taking on a daily, weekly, and monthly basis to set yourself up for success, sustainability, and longevity. No more overwhelm. No more questioning. No more lack of purposeful implementation and accountability. In order to prime you for major success in your business, we first tap into that deep, intuitive wisdom that will allow for manifestation through aligned, purposeful action that feels authentic to you! ✔ Easily Stand Out In A Crowded Marketplace By Leveraging Your Expert Coaching Skills: I’ll Show You Methods Of Standing Out By Being You! ✔ Use The Process Of Mindmapping To Create An Endless List Of Topics That Speak Directly To Your Clients’ Pain Points And Desires. ✔ Understand The Difference Behind A “Need-To-Have” Vs. A “Nice-To-Have” Offer So Your Programs Are Not Just Attractive And Enticing, But A Must-Have! Ready to jump in? Claim your spot now! No more throwing spaghetti against a wall and seeing what sticks! Or wondering, “What should I be doing in my business every day? !” You’ll learn what’s most important to focus on and have a step-by-step roadmap to income and impact! Learn the right systems to implement for success, longevity, and sustainability in your business. We start on the ground floor and focus on marketing and client attraction: both of which are crucial to any successful business! Once these systems are set and you get a feel of your business model, you can rinse, repeat and scale! Less overcomplicating. More feel good, consistent action in the right direction. That is the key to a steady, revenue-generating, client-attracting, successful business. You’ll learn the power of a growth-mindset, staying in your own lane, minimizing distraction, taking feel-good action, and streamlining your tasks. Consider me your personal #1 ally in your corner! No more going it alone, boo! No more trying out different things or spinning your wheels, or having excuses that leave you stuck, frustrated, and without accountability. You will receive tons of support plus a loving guide to hold you accountable and push you in the direction of profound personal and professional success. Your clients are out there right now. And they need the exact service you provide, and your unique way of providing it. Attracting ideal, paying clients is a loving process that starts with you and the way you work best. We create a method of client attraction customized to who you are and how you operate so it never feels pushy, sleazy, forced, or unloving. Starting to work with paying clients is not only the best way to help someone, (when both people are literally invested in the work, transformation happens)! It’s also the best way to gain confidence, testimonials, referrals, and attract, enroll, and scale your business! The program is set up to get you wins right away, so you are making money and helping others as soon as possible. Ultimately, Business Breakthrough Jumpstart is about you doing the work you are meant to do in this world...that, may I add, you are beyond capable of doing. You came out of coaching school with all the tools you need to help create powerful transformation in your clients. Those clients...they’re out there! This program is going to help you attract them and understand what activities result in clients so you can rinse and repeat while creating a business model that works for you that you can be proud of! Invest in your business...and yourself! More Q's? I Got You! When Does This Glorious Program Start? Program dates for 2019 will be released soon! Please email us at aliyalevinsoncoaching@gmail.com for more info. What Results Can I Expect From This Program? This program will lay the foundation for the most important mindset, systems, and strategy you need to successfully generate client attraction now. Clients who have worked with me in the past have quickly enrolled clients using this system. This is not a magic pill. This is for people who are ready and willing to learn, grow, and do the work. When you work the program, it will work for you! Do I Need A Coach/Program To Build My Business? You don’t “need” anything! There is tons of different information online that you can sort through. I’ve whittled down all the information I’ve learned through years being in the field, high-end mentorships, thousands of dollars spend into the “best of the best!” That means, you’re getting access to tried-and-true information and strategy plus for laying the foundation for a successful biz. I’ve cut out what doesn’t work, peeled away what you don’t need, and have a viable, sturdy, exciting program that will help you attract clients as soon as we dive in. There’s A Lot Of Free Information Out There! Won’t That Suffice? There is a ton of free information out there. We all know that. What you’re investing in is a high-end coach (whose been in your shoes) hand-delivering the most valuable, need-to- know content for launching your business right, plus hold you accountable to implementing the right way. After trying out free content, spending thousands of dollars on high-end programs, my goal is to minimize the time, energy, and money you’re spending looking for the right path. I Want To Get Into Facebook Ads, Instagram, And Building Things Up Online. Will This Help? This program prioritizes client attraction, attraction marketing, and building a solid groundwork for your business. Enrolling clients and beginning to set and hit income goals is going to help you hit the ground running in your business (and give you the confidence and know-how to move into ads, and brand-building). The offline sales cycles is faster than the online one, and in this program we do a little of both! You’re going to be well-versed in exactly what you need and do not need in order to have a streamlined business that runs smoothly. Great Q! Especially because there are thousands of programs out there promising various outcomes and results. What makes this program unique is that it both sets you up for quick wins (enrolling clients on your time schedule), as well as sets you up for long term success in your business. So we’re simultaneously supporting you in quickly attracting clients while building up strong systems that will serve you for years to come. Working “in your business” --making sure day-to-day tasks are completed and “on your business” --implementing solid long-term strategy is the key to longevity and success. Space is limited! Snag your spot NOW! Alright, you amazing, incredible, transformative coach! Awesome! I’m so excited to dive in and support you in attracting client and getting things going ASAP! We make it super simple for ya! Once you click you’ll be taken to the payment page where you’ll enter all pertinent details! Your name, email address, phone number, and credit card info. We take all major credit cards, Amex, Visa, Discover, Mastercard or via PayPal. To save your spot in the program you can pay in full here or in installments here. Within 24-hours of making your payment you’ll receive the welcome email mapping out all the details of the program. You’ll get access to the Facebook group and can start getting acquainted with other in the program! I’m so excited to start working with you to grow your business! I’m here for you and can’t wait to cheer you on toward success. Have questions? I got you. Please feel free to email us at: aliyalevinsoncoaching@gmail.com. Aliya helps small businesses think BIG! She is a Success Mindset Coach who helps new + emerging coaches cut out the overwhelm and uncertainty of being a business owner so they can focus on doing the work they love with the clients they love to serve! Using her Authentic Marketing Blueprint™ she helps her clients attract the people who need them most through feel-good relationship building strategies and simple but powerful visibility techniques (they can rinse and repeat for continued success)! 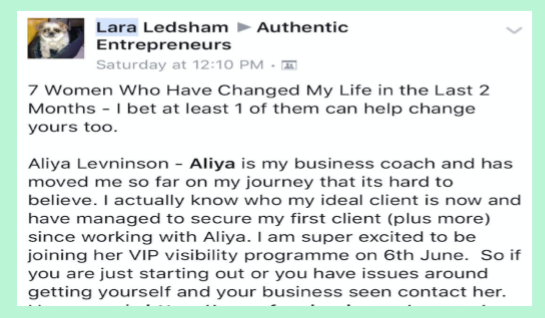 Aliya also helps leaders and CEOs reclaim their power and own their brilliance as they step into the next level in their biz so that they can let go of feeling like a fraud and successfully lead and create with confidence and authenticity and consistently set and achieve their revenue goals. Using her Authentic Success Mindset Blueprint™ she helps clients effectively release unhelpful past self-identifications and align themselves and their biz with their deep inner wisdom. Aliya is a Certified Professional Coach, LMSW, Huffington Post Blogger, and speaker who loves to coach, hip-hop dance, write poetry, and always says yes to a good piece of pizza or chocolate! After experiencing a death in her family, she went through a path of questioning purpose and found (through trial and error!) that doing what you love is the best way to live. Now, she helps others make their purpose and passion profitable. Aliya uses a fun, wise, and down-to-earth approach with her clients that allows them to be themselves, easily break through blocks, and see success in the form of money, clients, and strong relationships that manifest quickly and easily!